Music is taught to all classes in Key Stages 1 and 2 by our specialist teacher Mrs Cingo. The curriculum includes performing, composing, listening and appraising skills along with the development of knowledge and understanding of music and musical traditions. The overview of the curriculum content can be seen below. Opportunities to develop musical skills outside of the classroom have a high status with the school choir performing locally on a number of occasions. 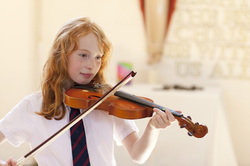 Children can also learn musical instruments through peripatetic lessons in brass, piano and violin and after school clubs for guitar and keyboard.